Henri was : - ... ambidextrous and was nearsighted; during his childhood he had poor muscular coordination and was seriously ill for a time with diphtheria. He received special instruction from his gifted mother and excelled in written composition while still in elementary school. 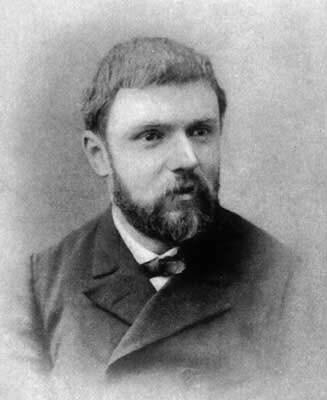 After graduating from the Ecole Polytechnique Poincaré continued his studies at the Ecole des Mines. His : - ... meticulous notes taken on field trips while a student there exhibit a deep knowledge of the scientific and commercial methods of the mining industry; a subject that interested him throughout his life. After completing his studies at the Ecole des Mines Poincaré spent a short while as a mining engineer at Vesoul while completing his doctoral work. As a student of Charles Hermite, Poincaré received his doctorate in mathematics from the University of Paris in 1879. His thesis was on differential equations and the examiners were somewhat critical of the work. They praised the results near the beginning of the work but then reported that the : - ... remainder of the thesis is a little confused and shows that the author was still unable to express his ideas in a clear and simple manner. Nevertheless, considering the great difficulty of the subject and the talent demonstrated, the faculty recommends that M Poincaré be granted the degree of Doctor with all privileges. Immediately after receiving his doctorate, Poincaré was appointed to teach mathematical analysis at the University of Caen. Reports of his teaching at Caen were not wholly complimentary, referring to his sometimes disorganised lecturing style. He was to remain there for only two years before being appointed to a chair in the Faculty of Science in Paris in 1881. In 1886 Poincaré was nominated for the chair of mathematical physics and probability at the Sorbonne. The intervention and the support of Hermite was to ensure that Poincaré was appointed to the chair and he also was appointed to a chair at the Ecole Polytechnique. In his lecture courses to students in Paris : - ... changing his lectures every year, he would review optics, electricity, the equilibrium of fluid masses, the mathematics of electricity, astronomy, thermodynamics, light, and probability. In  Toulouse explains that Poincaré kept very precise working hours. He undertook mathematical research for four hours a day, between 10 am and noon then again from 5 pm to 7 pm. He would read articles in journals later in the evening. An interesting aspect of Poincaré's work is that he tended to develop his results from first principles. For many mathematicians there is a building process with more and more being built on top of the previous work. This was not the way that Poincaré worked and not only his research, but also his lectures and books, were all developed carefully from basics. Perhaps most remarkable of all is the description by Toulouse in of how Poincaré went about writing a paper. Poincaré : - ... does not make an overall plan when he writes a paper. He will normally start without knowing where it will end. ... Starting is usually easy. Then the work seems to lead him on without him making a wilful effort. At that stage it is difficult to distract him. When he searches, he often writes a formula automatically to awaken some association of ideas. If beginning is painful, Poincaré does not persist but abandons the work. Toulouse then goes on to describe how Poincaré expected the crucial ideas to come to him when he stopped concentrating on the problem : - Poincaré proceeds by sudden blows, taking up and abandoning a subject. During intervals he assumes ... that his unconscious continues the work of reflection. Stopping the work is difficult if there is not a sufficiently strong distraction, especially when he judges that it is not complete ... For this reason Poincaré never does any important work in the evening in order not to trouble his sleep. As Miller notes in : - Incredibly, he could work through page after page of detailed calculations, be it of the most abstract mathematical sort or pure number calculations, as he often did in physics, hardly ever crossing anything out. Before the age of 30 he developed the concept of automorphic functions which are functions of one complex variable invariant under a group of transformations characterised algebraically by ratios of linear terms. The idea was to come in an indirect way from the work of his doctoral thesis on differential equations. His results applied only to restricted classes of functions and Poincaré wanted to generalise these results but, as a route towards this, he looked for a class of functions where solutions did not exist. This led him to functions he named Fuchsian functions after Lazarus Fuchs but were later named automorphic functions. The crucial idea came to him as he was about to get onto a bus, as he relates in Science and Method (1908) : - At the moment when I put my foot on the step the idea came to me, without anything in my former thoughts seeming to have paved the way for it, that the transformation that I had used to define the Fuchsian functions were identical with those of non-euclidean geometry. In a correspondence between Klein and Poincaré many deep ideas were exchanged and the development of the theory of automorphic functions greatly benefited. However, the two great mathematicians did not remain on good terms, Klein seeming to become upset by Poincaré's high opinions of Fuchs' work. Homotopy theory reduces topological questions to algebra by associating with topological spaces various groups which are algebraic invariants. Poincaré introduced the fundamental group (or first homotopy group) in his paper of 1894 to distinguish different categories of 2 - dimensional surfaces. He was able to show that any 2 - dimensional surface having the same fundamental group as the 2 - dimensional surface of a sphere is topologically equivalent to a sphere. He conjectured that this result held for 3 - dimensional manifolds and this was later extended to higher dimensions. Surprisingly proofs are known for the equivalent of Poincaré's conjecture for all dimensions strictly greater than three. No complete classification scheme for 3 - manifolds is known so there is no list of possible manifolds that can be checked to verify that they all have different homotopy groups. His first major contribution to number theory was made in 1901 with work on : - ... the Diophantine problem of finding the points with rational coordinates on a curve f(x, y) = 0, where the coefficients of f are rational numbers. In applied mathematics he studied optics, electricity, telegraphy, capillarity, elasticity, thermodynamics, potential theory, quantum theory, theory of relativity and cosmology. In the field of celestial mechanics he studied the three-body-problem, and the theories of light and of electromagnetic waves. He is acknowledged as a co-discoverer, with Albert Einstein and Hendrik Lorentz, of the special theory of relativity. We should describe in a little more detail Poincaré's important work on the 3 - body problem. He also wrote many popular scientific articles at a time when science was not a popular topic with the general public in France. As Whitrow writes in : - After Poincaré achieved prominence as a mathematician, he turned his superb literary gifts to the challenge of describing for the general public the meaning and importance of science and mathematics. Poincaré's popular works include Science and Hypothesis (1901), The Value of Science (1905), and Science and Method (1908). A quote from these writings is particularly relevant to this archive on the history of mathematics. In 1908 he wrote : - The true method of foreseeing the future of mathematics is to study its history and its actual state. Finally we look at Poincaré's contributions to the philosophy of mathematics and science. The first point to make is the way that Poincaré saw logic and intuition as playing a part in mathematical discovery. He wrote in Mathematical definitions in education (1904) : - It is by logic we prove, it is by intuition that we invent. In a later article Poincaré emphasised the point again in the following way : - Logic, therefore, remains barren unless fertilised by intuition. It is reasonable to ask what Poincaré meant by "intuition". This is not straightforward, since he saw it as something rather different in his work in physics to his work in mathematics. In physics he saw intuition as encapsulating mathematically what his senses told him of the world. But to explain what "intuition" was in mathematics, Poincaré fell back on saying it was the part which did not follow by logic : - ... to make geometry ... something other than pure logic is necessary. To describe this "something" we have no word other than intuition. The same point is made again by Poincaré when he wrote a review of Hilbert's Foundations of geometry (1902) : - The logical point of view alone appears to interest [Hilbert]. Being given a sequence of propositions, he finds that all follow logically from the first. With the foundations of this first proposition, with its psychological origin, he does not concern himself. We should not give the impression that the review was negative, however, for Poincaré was very positive about this work by Hilbert. In Stump explores the meaning of intuition for Poincaré and the difference between its mathematically acceptable and unacceptable forms.